Kick off to Speak Up 2013! Surveys are now open for input through Dec. 20th! Happy October to all of our followers and supporters! We hope the beginning of the month has treated you all well. This Blog Post is specifically dedicated to the launch of SPEAK UP 2013! Below, you’ll find all the information you need on what’s new for 2013. Happy Reading, and remember to Speak Up now through December 20th! 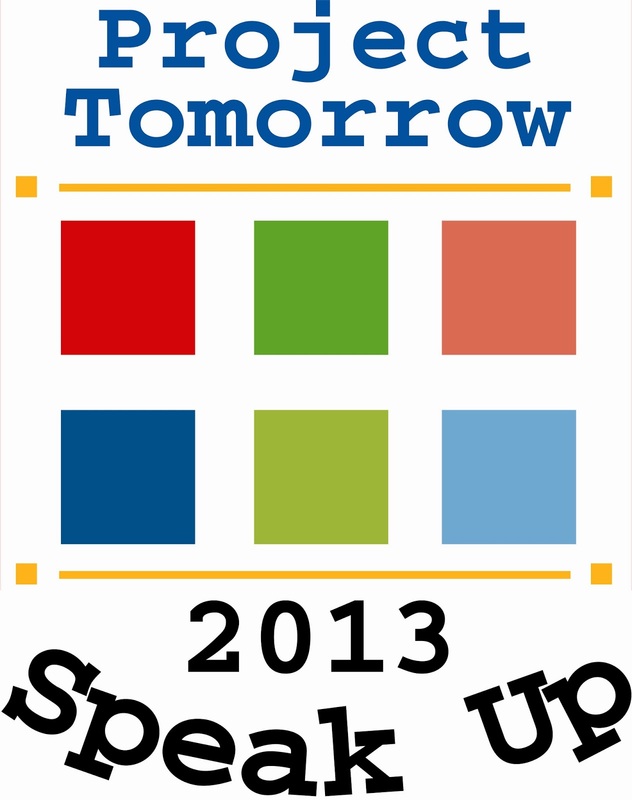 Speak Up is officially open for input now through December 20th, 2013 at http://www.speakup4schools.org/speakup2013! This year, students will again be asked about their use of mobile tools, social networks and gaming as part of their learning in and out of the classroom. The survey will explore the concept of gaming in learning a little deeper this year to provide a comparison to similar questions asked in 2009. Students will also be asked about how they manage their digital footprints (i.e. the information about them that is available online). Teachers and administrators will be asked about how technology used in the classroom, what they think new teachers need to know about technology use and how prepared they are for technology use. Parents will be asked about how their children use technology for learning, about their level of support for technology use in schools and familiarity with common core assessments. For the first time, students and educators will be asked about how technology is being used (or not used) to teach and improve writing skills. Also new this year is a survey for community members, including child care providers, business leaders, grandparents, school board members, or anyone interested in local schools. Please be sure to share the Speak Up surveys with your network of friends and family- every voice counts! Together, let’s work towards leveraging technology to promote enhanced learning in our K-12 schools! Additional questions topics include: learning and teaching with technology, 21st century skills, games, STEM career exploration, online and blended learning, flipped classrooms, mobile devices, digital and online textbooks, writing with technology, professional development, school-to-home communications, digital citizenship, and common core assessments. After more than a decade and 3 million participants, Speak Up continues to be the only annual, national survey to ask students, educators and parents how they use – and how they would like to use – technology for learning. 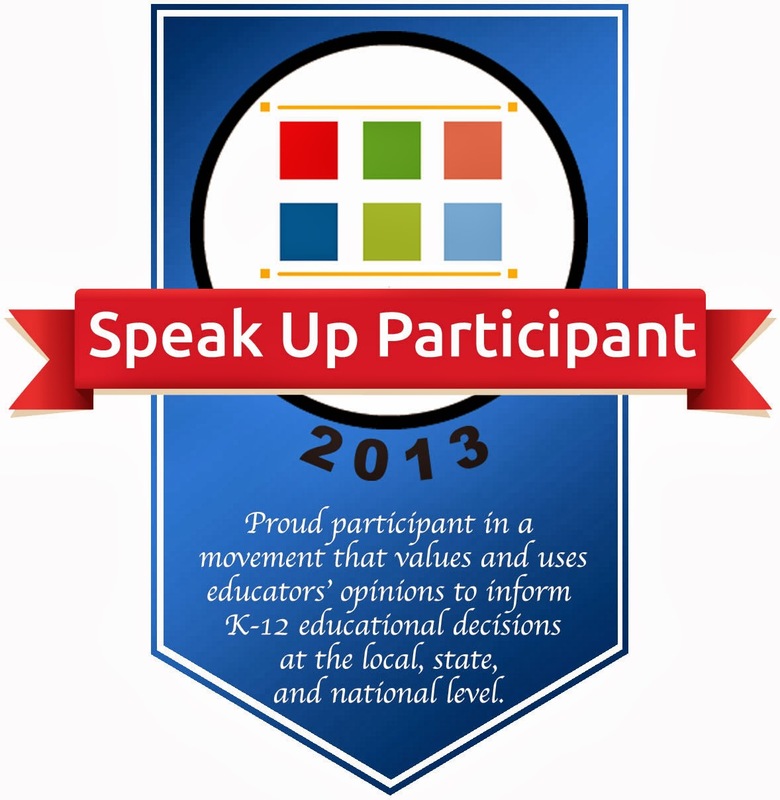 All schools (public, charter and private) are eligible to participate in Speak Up—all you have to do is encourage your students, teachers, parents, administrators and community members to go online and take the 20 minute survey at: www.speakup4schools.org/speakup2013now through December 20th! *Please note students will need a secret word to access the survey, which can be assigned during the primary contact registration process. Get your school(s) and local community involved today! Sign up as the primary contact of your school or district to manage your information and assign an administrative password to access your local data starting February 5, 2014 (in celebration of Digital Learning Day). You may sign up as a primary contact for your district via our website http://www.speakup4schools.org/speakup2013/Register.aspx, or if you prefer, we are more than willing to complete the registration process for you– All you have to do is click here to send us an email with your registration request. Please include the name of your district or school, and state. We will then send you a follow up email with a PDF of your school list and passwords to confirm that your district/school has been registered. ■ All schools and districts will be automatically registered to participate (listed as active). No longer need to register a school to take the survey, but school and district administrators are encouraged to sign up as the primary contact to manage school(s) information and assign an administrative password to gain access to local data come Feb. 2014! ■ Educators and parents will not be required to enter a survey password. ■ New survey created for Community members and Business Partners. So please be sure to take the survey today and share with your network of friends and family. ■ State Specific pages, check here to view your state specific page. ■ Lastly, we are excited to announce that this year we will be offering badges to all educators that complete the survey, we should hopefully have these available to participants a little later this week. *If you’ve already taken the survey, please contact the Speak Up Team for your badge at: speakup@tomorrow.org. 4. Students will be required to enter in their district’s survey password “secret word”. Educators, parents and community members are not required to enter in a survey password. Our helpful and handy promotional materials are here to help you spread awareness surrounding speak up! Our newly updated promotional material pageprovides schools and districts with guides, e-mail templates, tweet lists, banners, and more! To get started we suggest posting the Speak Up link http://www.speakup4schools.org/speakup2013, dates (now-12/20) and survey password on your school calendar and/or websites as well as promoting/encouraging participation of the survey during back to school night activities & PTA meetings. Below you will find NEW promotional materials that explain both the background and benefits of participation to help get the word out about Speak Up. Start spreading the word about Speak Up to your community! Share this speak up flyer with your staff, parents and local community members. Provides background information on the Speak Up Research project, available surveys, question topics and benefits of participation. Also great as an email, newsletter or blog template! This informational flyer is a great way to create awareness about the survey to teachers. The flyer explains the background of the Speak Up project and the importance of participation by teachers and their students. Also provides simple step by steps instructions for teachers to access the survey. *Similar flyers available for Students and Parents. Provide easy access to the Speak Up surveys by embedding one of our URL linked Speak Up banners on your district or school’s homepage, blogs or social media outlets, in your email’s signature or sharing the banner with other community websites (such as your city or county’s website). Having your students take the survey in class? 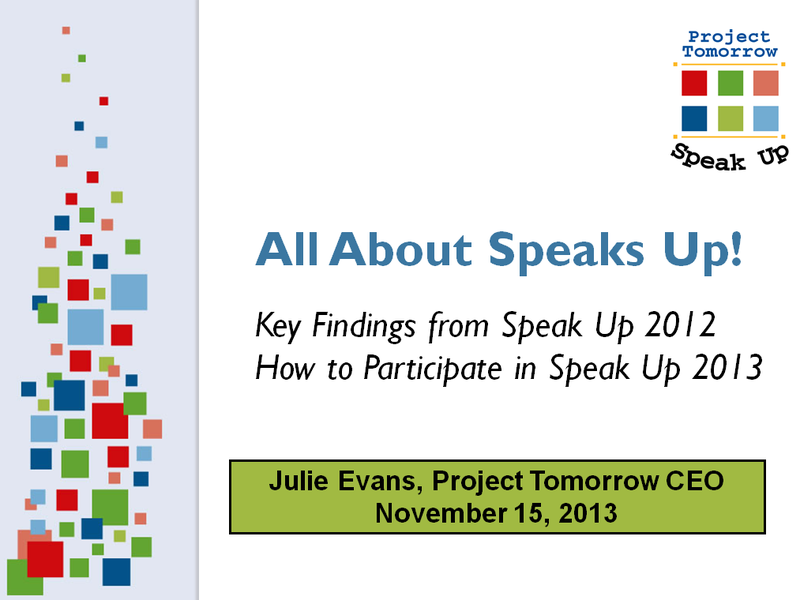 Use one of our Speak Up Lesson plans to facilitate participation. Also great activity for sub plans or before fall/winter break! K-2, 3-5 and 6-12 are now available for download. If you are administering the survey as a group exercise, please download our group survey instructions. Includes a copy of the survey questions and a place to mark your collected responses. Group surveys are available for K-2 students, Parents, Parents (Spanish) and Community Members/Business Partners. If you have any questions please feel free to contact the Speak Up Team at speakup@tomorrow.org or via phone at 949/609-4660 ext. 17. This entry was posted in Speak Up and tagged Educational Technology, K-12 education, Speak Up 2013, Surveys on October 10, 2013 by Project Tomorrow.